Maiko Araki joined UNU-IAS as a Programme Coordinator for the Post Graduate Program in April 2016. Before joining UNU-IAS, she served for seven years as a Program Officer at University of Tsukuba working as part of a master’s program targeting young professionals from developing countries. Prior to that, she worked in finance. 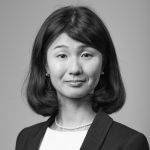 Maiko holds a BA in Education from Sophia University and MA in Higher Education Administration from J. F. Oberlin University.